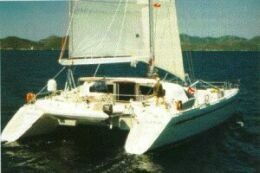 Like many other sailors, I have always been "frightened" by catamarans. The word alone stirs up in the mind of "mono-hull"- minded people, images of capsized boats that never come up again or, worse, boats that suddenly put their bows under the waves sending the crew flying several hundred meters away. And then as time goes by, one sails a few catamarans, charters one for a "test" cruise, then goes on skippering it ... and ends up changing his mind. After all, when races show that even mono-hulls do capsize without ever coming up again, one realises that you "either don't know a catamaran or you love it!" Assuming we are writing for people who know and love catamarans, we might say that this Privilege 65 gives a bad blow, and perhaps a fatal one, to those who believe that a catamaran just cannot be labelled as a "beautiful yacht". We liked her aggressive beauty, her impressiveness, her apparent calm and serenity. But besides her profile, below decks one is really fascinated by the design of the interior - which is always horizontal even when beating - it is all in light/dark contrast, which is rarely seen even on "one-off" yachts. But aesthetics does not compromise rationality: the way the space is exploited is absolutely exceptional. Safety is a priority, and it is absolute. This yacht, thanks to the four watertight compartments, is considered by French authorities to be unsinkable. 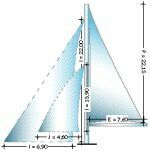 This fact allowed the designer to put plenty of sail area: with mainsail and gennaker, there are over 300 square meters of sail. 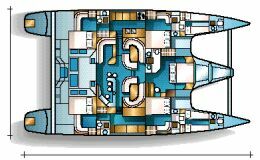 Different interior layouts are available, depending basically on how the central hull is exploited: it can house two guest cabins with en-suite heads, or one guest cabin and the owner's cabin each with its own heads, or else the owner's stateroom. 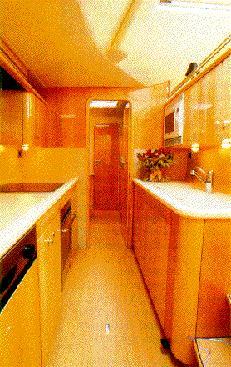 Other interior layout formats include the possibility to have a crew cabin forward. 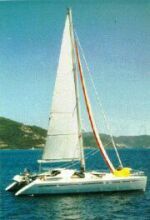 The yacht we have sailed is devoted to chartering, and has some peculiar features: all systems (air conditioning included) have duplicates so that even in case something goes wrong, one can still use the other system while repairing the defective one; main systems are controlled through hydraulic control panels; there is a helmsman cockpit on each hull, each fitted with VHF controls, auto-pilots, hydraulic systems panels etc. ; only the engines have their panel and controls just on the starbord hull. A peculiarity of the yacht we tested, is the "crow's nest" on the lower spreader, which is very useful to see passages among the coral reefs, where this particular yacht will be sailing: the Caribbean Sea. Full load cruising displacement: 25.000 kg. Optional equipment (in French francs): hydraulic control panel: 450.000FF; second cockpit table: 15.000FF; 200 sq.m. gennaker equipment: 25.000FF; hydraulic furling 103 sq.m. mainsail: 150.000FF; air conditioning: 140.000FF; washer/dryer 20.000FF; additional 265 litres freezer 16.000FF; depressor flushing wc 50.000FF. Rudders: stratified with fibreglass and epoxy resin. Maximum speed under power: 9 knots at 3.500 rpm. Engines' vibrations: limited,and only at max. rpms (3.500 rpm). Docking manoeuvrability: excellent; thanks to the two engines with distant shafts, the yacht may be steered with "millimetric" precision. Hull: designed for deluxe cruising, specifically destined to chartering or as a "public relations tool"
Finishing: excellent, with great care for details. Interior. Well conceived and designed, with a high degree of finishing even in the crew quarters; the only flaw is the small door leading to the owner's cabin (mind your head!). Chain locker: spacious and fitted with a vertical Lewmar 3.000 Watt anchor windlass; lockers to stow fenders and ropes. Cranes: aft, between the hulls to haul the tender; they house an outboard stand. Deck hardware: good quality and well-dimensioned; the bigger blocks are all by Lewmar, with tackles and big diameter roller and ball bearings. 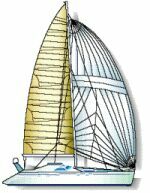 Winches: 2 two-speed, hydraulic self-tailing Lewmar 77 ST winches for the jib sheet; 1 two-speed, hydraulic self-tailing Lewmar 52 ST for the mainsail sheet; 1 two-speed, hydraulic self-tailing Lewmar 44 ST for the traveller (central); two-speed, hydraulic self-tailing Lewmar 52 ST mast mounted for the mainsail and the leach reef cringle; 1 two-speed, hydraulic self-tailing Lewmar 46 ST for the bow halyards. Engine instruments: standard control panels by the builder. Swimming ladders: fair, steps on both transoms with fold-down ladders and fold-up swim ladders positioned amidships. Closing system: with sliding locking doors. Lockers and hanging locker volume: good. Maximum berth width: 70 cm. minimum berth width: 50 cm. Minimum headroom over the berths: 70 cm. Maximum berth width: 155 cm. headroom over the berths: 120 cm. Minimum headroom over the berths: 80cm. Minimum headroom : 180 cm. Berth length: 205 cm. Maximum berth width: 200 cm. Maximum headroom over the berths: 150 cm. Minimum headroom over the berths: 150cm. Engine vibrations under power: absent. Minimum headroom : 185 cm. minimum berth width: 155 cm. Maximum headroom over the berths: 10 cm. Minimum headroom over the berths: 120cm. Minimum headroom : 200 cm. Lockers and hanging locker volume: there are no lockers. Ventilation: excellent, with permanent fans. Accessories: gas detector, Hi Fi stereo set, complete with CD player. some passageways (like the door leading to the owner's stateroom) are restrained; the jib sheet touches the coachroof.